Bremen is the 10th largest city in Germany with a population of nearly 600,000. As a 1200-year-old city and member of the Hanseatic League, Bremen has a long tradition as an important port city and as an industrial and commercial center. Its seafaring tradition is evident in the city’s cultural festivals and its architecture, including the Schlachte Embankment, a promenade on the River Weser that serves as a gathering place for locals and visitors alike. The Bremen Town Hall, located in the Market Square, was completed in 1410 and is a UNESCO World Heritage Site. The city boasts one of the largest urban regeneration projects in Europe in the Uberseestadt District, where the old city docks are being transformed into a community five times the size of the city center. Among the city’s most famous attractions is a statue based on a folktale by the Brothers Grimm, The Bremen Town Musicians. 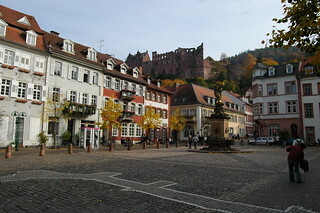 Hobart and William Smith Colleges maintain an exchange program with the University of Bremen in northwestern Germany. The university is comprised of 17,000 students, with most academic buildings located on a campus just outside the city center. This program provides HWS students the opportunity to develop German language skills while taking a variety of other courses in English alongside German students as well as other international students. In addition to German language and culture courses (offered at all levels, from beginning to advanced), students will be able to choose from a wide selection of English-language courses in several areas, including international relations, computer science, political science, history, economics, biology, media and society, and literature. For a complete list of courses please visit here or check with the CGE. Please select “English spoken only” for the display of classes held in English. This program can accommodate a variety of students and is designed for those who are interested in learning more about Germany and in developing German language skills. Students in international relations, political science, economics, history, computer science, biology, media and society, European Studies, and German Area Studies will find the program of particular interest. This program is open to all juniors and seniors (sophomores may be considered in exceptional cases) in good academic and social standing with a minimum GPA of 3.0. In addition, students must have completed at least one semester of college-level German prior to the program and must take a German language course in Bremen. Exchange opportunities depend on the availability of slots at the host institution. Due to the challenging nature of study abroad, student academic and disciplinary records will be carefully screened. Note: due to the timing of the academic calendar at the University of Bremen, seniors participating in the spring semester will not be able to return in time for commencement on the HWS campus. The spring program runs from mid-March—July. Students will live in residence halls or apartments alongside other international and German students. There are communal kitchen/cooking facilities so that students may prepare their own meals or they may purchase meals in affordable student cafeterias around the university. The International Office in Bremen will assist students in locating housing. Homestay options may be available and interested students should contact the CGE for further information. The Bremen program is not a “study abroad program” in the traditional sense in that HWS students will be directly enrolled at the university. While there will not be excursions designed specifically for HWS students, it is very easy for students to plan outings in and around Germany. There are also student travel agencies nearby to assist those planning their own travel. Students will be charged standard HWS tuition and fees and a $600 administrative fee. This will cover tuition for a four-course semester, health insurance, and program orientation. Note that no room or board charge is included. Students will pay room fees directly and should plan to bring their board fee to cover meal expenses throughout the program. Room costs will vary depending upon the option chosen but should range from $2,500—$2,800. While meal expenses will vary according to individual tastes, we estimate that $2,200—$2,400 should be sufficient for students who prepare their own meals. (Full-year students will need to plan accordingly to cover two semesters). Additional expenses not covered include airfare, books, residence permit, and personal expenses (laundry, entertainment, ground transportation, and independent travel). We estimate airfare for this program at $1000-$1200 from the East Coast, books at $250, and residence permit at $150. It is difficult to give an accurate estimate of personal expenses because student spending habits differ considerably. We would suggest a minimum of $1500 above and beyond meal and accommodation expenses. However, students on a tight budget should be able to manage with less. If you are concerned about finances, we strongly encourage you to talk to the CGE staff who can offer information and advice based on your specific situation.